WHAT IS THE FIRST® ROBOTICS COMPETITION® (AKA FRC®)? The FIRST Robotics Competition (FRC) pairs high school students with adult mentors (primarily engineers and teachers) to design and build robots that compete against one another in this high energy “Varsity Sport for the Mind™”. Each year at the Kickoff in January, a new, challenging game is introduced. These exciting competitions combine the practical application of science and technology with the fun, intense energy and excitement of a championship-sporting event. Teams are encouraged to display Gracious Professionalism® and to cooperate while competing – known as Coopertition™. 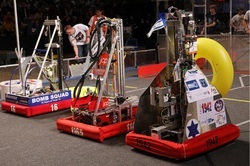 .The FIRST Robotics Competition combines the excitement of a varsity sport with hands-on training in science and technology to help high school students discover how rewarding a career in engineering or technology can be. Remote-controlled robots, piloted by students and cheered on by thousands of screaming fans, go head-to-head in short games on the floor of a sports arena, battling it out to earn points during a two-minute round. Students on FIRST teams learn from and play with the "pros" - professional engineers who donate their time to work side-by-side with students to help design and build the sophisticated competition robots. This gives FIRST students an insider's view of a career in science, engineering and technology not possible in a normal classroom setting. Plus, unlike other high school athletics, every student on a FIRST robotics team has a chance to turn "pro." In 2013, FRC will reach 60,000 high-school students representing approximately 2,700 teams. FRC teams come from nearly every state in the United States, as well as from Australia, Bosnia-Herzegovina, Brazil, Canada, Chile, Dominican Republic, Germany, Israel, Mexico, Puerto Rico, Turkey and the United Kingdom. FRC teams will participate in sixty Regional Competitions, over a dozen FRC District Competitions, one State Championship, and one Region Championship, and approximately 400 deserving teams will qualify to go to the FIRSTChampionship in the Edward Jones Dome in St. Louis, MO.